With an electric mixer, whip heavy whipping cream until soft peaks are formed. In a heatproof bowl, melt 1-1/2 cups chocolate hazelnut spread in 20-second intervals, stirring until very easy to spread. 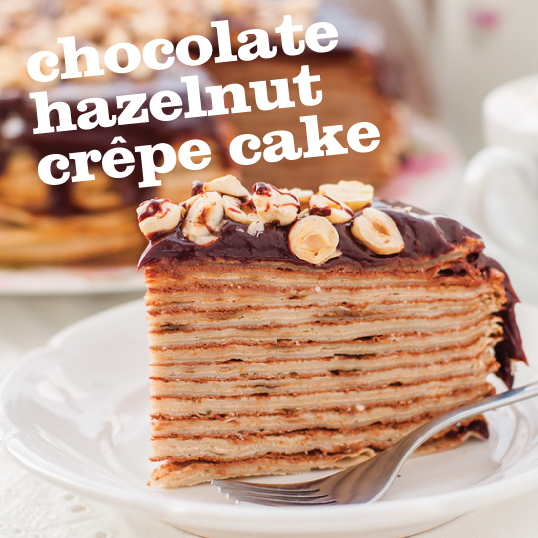 On a cake plate, begin laying 1 crepe, then spread a thin layer of chocolate hazelnut spread, and whipped cream. Repeat to desired height (at least 15 crepes). Melt the additional 1/2 cup chocolate hazelnut spread, and spread it on top layer. Garnish with toasted, whole hazelnuts. Refrigerate until firm or at least 1 hour. Add a layer of thinly sliced fresh strawberries and/or banana after chocolate hazelnut spread, then top with whipped cream.